The work of Crimean Titanium factory was suspended for two weeks because of emissions of sulfur dioxide. A state of ecological disaster was declared in the town of Armyansk. More than 4,000 children are being evacuated, schools in the town of Armyansk were closed for two weeks as a result of the accident. Emissions of harmful substances into the atmosphere occurred due to the negligence of both the owner of the factory and the local authorities. Crimean Titanium belongs to Ukrainian oligarch Dmitry Firtash. Accidents have occurred at the factory before too, although they were of smaller scale. "Emission of chemicals into the atmosphere led to an increase in atmospheric air temperatures. They also resulted in the sustainable absence of precipitation, and a lower water level in the acid storage facility," Deputy Prime Minister of Crimea, Igor Mikhailichenko said. This term 'acid storage facility' designates a diked part of Sivash Lake also known as the "Rotten Lake." The owner of the factory continued the dangerous production, knowing that there was not enough water to neutralize acid and did not report the emergency to the authorities. As for the local authorities, supervisory bodies seem to have ignored the fact that there was no water running on the blocked North-Crimean channel to the factory. The authorities were supposed to close the factory, but they turned a blind eye on the problem and preferred to let chips fall where they may. 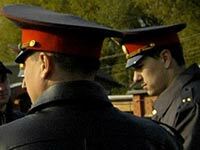 Residents of Armyansk started complaining on August 23, but the authorities set up a commission only on Aug. 28. At first, most of the patients were diagnosed with ARVI (acute respiratory viral infection), but they later developed allergic conjunctivitis, allergic pharyngitis and Quincke's edema. Meanwhile, the head of the Crimea, Sergei Aksenov, continues to say that people's lives are out of danger and there is no threat to their health, although it was Aksenov, who ordered children to be evacuated from the affected region of the peninsula. Crimean Titanium is the largest producer of titanium dioxide in Eastern Europe. The company also produces red iron oxide pigment, mineral fertilizers, sulfuric acid, aluminum sulfate, liquid sodium glass, and iron vitriol.